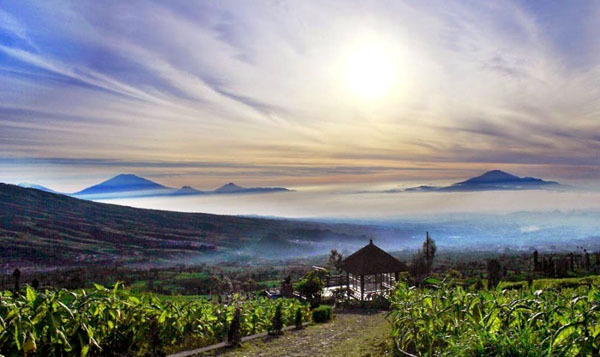 Tourists can enjoy beautiful nature views in Dieng Plateau, which is considered the best tourist spot in Wonosobo, Banjarnegara, and Temanggung District. Still, they would be astonished by other attractions as well called Sindoro Posong Hill. It is a great place to witness both Sindoro and Sumbing Mountain with a perfect point of view. The location is in Kledung Sub-District, which connects Temanggung and Wonosobo. To be exact, it is located in in Tlahap Village and has become a reliable domestic tourist spot, especially to enjoy the beauty of the sunrise. An access to Sindoro Posong Hill features a rocky route, which is considered narrow – Only a car can pass through it one at a time. That means it becomes an issue when two cars coming from different directions. In order to avoid such issue, tourists should choose a motorcycle taxi which is swifter and more efficient. Apart from such narrow route, visitors would pass through villagers’ houses when reaching the site. Once they reach the gate post, they need to pay the entrance fee. Have no worries. It is affordable. The management might use the money to improve the facilities and services on that site, after all. The best activity to do in Sindoro Posong Hill is definitely to witness the majestic views of Sindoro and Sumbing Mountain. Apart from these attractions, visitors take advantage of the site to hunt beautiful sunrise. This explains why most of them come to the hill in the morning before the sun rises. They also carry a camera in order to capture all of the breathtaking nature views on that site. Moreover, there are signature lures of Sindoro Posong Hill called Watu Kelir and Watu Mlongso, which are the dead river formed naturally by a volcanic eruption. The next view to enjoy is local farms that come with a vast size. Local farmers are often seen as well, working on their farms and cultivating several local plants like tobacco, clove, coffee, etc. For those who want to rest, they can relax in available gazebos and eateries. Other facilities are also available including a parking lot, musholla, and toilets. There is even a small house to rent so tourists can spend some time on that site, enjoying true atmosphere of Sindoro Posong Hill. It is true that the site offers some local eateries (warung). However, only simple snacks and foods are available there including roasted peanuts, instant noodles, tea, and coffee. The locals often recommend their coffee, which tastes different than other regions. Well, that is the fact. It has a great aroma and mild taste. What a suitable drink to enjoy a comfortable nuance of Sindoro Posong Hill. Overall, it is not inferior to Sikunir Hill, which is a top tourist spot in Dieng Plateau. From Temanggung City, the trip takes about 30 minutes to reach the gate of Sindoro Posong Hill. The distance is 9.2 km, after all. When it comes to the best route, travelers can take advantage of Campur Salam Street.